Looking for fun ways to celebrate Mother’s day with your family this year? I’ve got some ideas that will make this special day one to remember. Set aside all other plans and treat the mother as a queen for the day. Turn the day into a one day adventure to someplace special. Grab the whole family and head to a favorite park, lake or beach. Spending the time together is what really counts, so have a picnic, go for a bike ride, or do some gardening together. Remember it’s her day so pick an outdoor activity she loves. 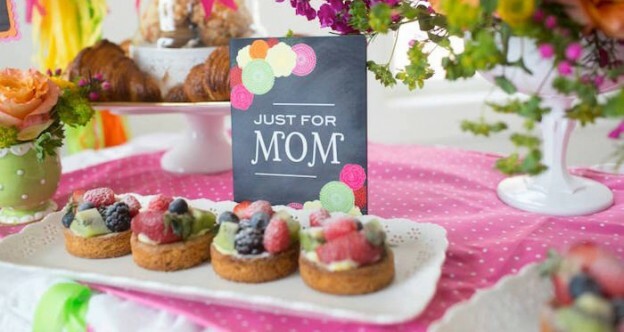 Making a Mother’s Day celebration memorable and unique doesn’t have to be complicated or expensive. It could be as simple as family gathering and other “mom” members of the family such as grandmothers or even great grandmothers. What can be more festive than the gathering of generation? 1.Spinach, Artichoke, and Sun-Dried Tomato Fritatta Here’s a flavorful frittata that errs on the classic menu side. Main ingredients—spinach, artichokes, and sun-dried tomatoes—pair perfectly with fresh basil and feta. It’s truly egg-cellent. 2. Smoked salmon and cream cheese cucumber bites. Livened up with a zingy horseradish and dill cream cheese, these simple yet fancy smoked salmon and cream cheese cucumber bites are crunchy, creamy finger food food perfection! You’re going to just love them! 3. Blueberry croissant puff. How about an easy blueberry puff using croissant as a base? Easy to make and everybody will love it…specially your mom. Mums are priceless and you can’t put a price on love, but everyone likes a present. Whether your mother is into fashion, food or beauty, there are gifts to fit every budget. In case you’re lacking inspiration, here is some inspiration so you can find the perfect present for the most important woman in your life. DIY Grarden Markers (via playgroundparkbench) There are hundreds of DIY gift ideas but my mom loves gardening and she always enjoys doing an activity with me. So instead of offering her a bunch of garden markers I’m planning to prepare a DIY kit so we can make them together that day. If I know my mother well (I do) she will be thrilled! Best mom ever mug (via willow and olive) Personalized messages on mugs are always a nice gift for coffee and tea lovers. I don’t know about your moms but mine would definitely love to have a “best mom mug” to drink her daily tea and brag on her friends about it! No matter your mother is a house wife or a busy working lady a self care gift set will be valued by every woman. Self care is very important and you could gift your mother some items for daily self care. Choose general self care items like body lotions, shampoos etc. This year I am going to pick something out of Korres collection. Korres is a Greek organic skin care and make up range with a huge authentic array of products to choose from. Here’s an interesting fact – all products are made from ethically-sourced natural herbs and use homeopathic remedies which has even awarded Korres a Nobel Prize for its innovative research… now you’ve got to admit that is impressive? Gives me ideas for tomorrow. 🙂 Thanks for a lovely post!